Members of the local community have been receiving free post-festive check-ups and advice from trainee pharmacists at the University of Reading. Fourth year students from the Reading School of Pharmacy took part in two initiatives, a new mobile health clinic and also running a health fair in the Broad Street Mall. The mobile Healthy Living Assessment and Advice (HLAA) service launched on 14th January at the Earley CResCent Resource Centre. It is designed to help inspire change and healthy living in the post-Christmas / New Year period. Eight students tested 44 participants’ blood pressure, glucose and cholesterol levels, as well as weight and lifestyle assessments. The students also offered free personalised lifestyle advice on what changes the participants can make to improve their health now and in the future. The service is funded by the Earley Charity and is run in partnership with Reading Borough Council’s First Stop Health Bus operated by the Mustard Tree charity. The University worked closely with the Earley Charity to identify geographical areas that might benefit from free health advice. The students also ran a Health Fair in Reading’s Broad Street Mall on 12th and 13th January 2015. Students gave information and advice on a variety of health topics, including diabetes, asthma, prostate cancer and smoking cessation. All fourth year students participated over the two days, speaking to more than 50 people. 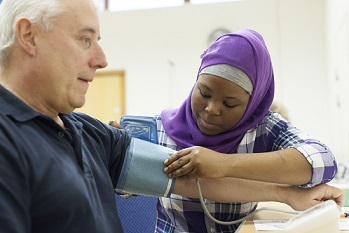 Professor Richard Ellis, Dean of Life Sciences at the University of Reading, said: “These activities have proved an immediate success with members of the local community and our fourth year Pharmacy students alike. It is a great opportunity for the students to engage with the community in realistic conditions and build their confidence before they enter the workforce, hopefully later this year. Initiatives such as these set our School of Pharmacy apart from other universities that are yet to develop public-engagement activities that provide mutually beneficial pharmacy-led health services.